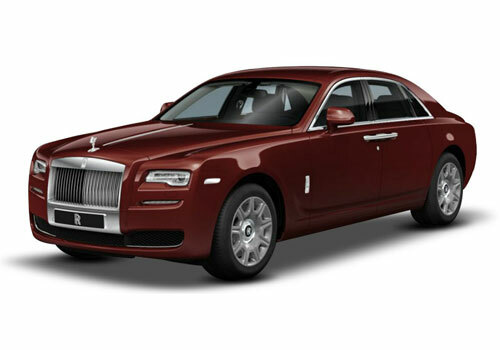 The full sized luxury saloon, Rolls Royce Ghost Series II has made its entry in the Indian car market. It is available in two variants with a powerful petrol engine as standard under the hood. This Rolls Royce Ghost Series II Standard is a base level trim in its model series that has received several updates to its exteriors. These include the rectangular LED headlamps that are surrounded by day time running lamps, a revised bumper, new bonnet design featuring 'the spirit of ecstasy', redesigned waft line and chrome inserts on the radiator grille. Besides these, it is offered with new external paint and wheel options for the customers to select from. On the insides, it has redesigned front seats with electronically adjustable thigh support. The rear seats are also revised, while the instrument cluster gets slight changes. It also includes a new infotainment system with 10 inch multimedia screen and a touch pad controller as well. It has satellite aided transmission as standard, which utilizes GPS and mapping data. In terms of technical specifications, it is equipped with a 6.6 litre petrol engine that is capable of producing a peak power of 563bhp in combination with 780Nm torque output, which is rather impressive. This vehicle consumes just 4.9 seconds to accelerate from 0 to 100 Kmph. It is offered with several exciting body paint options for the buyers to pick from. It comes with an overall length of 5399mm along with a total width and height of 1948mm and 1550mm respectively. It has a long wheelbase of 3295mm, which is quite impressive. The car maker has designed it in an extraordinary way and equipped it many styling aspects, which gives it a trendy appearance. Starting with the front facade, it has a wide windscreen that is equipped with a couple of wipers. One of the key aspects in its front fascia is the aggressive radiator grille that has chrome inserts. It has a sleek bonnet on which, the redesigned waft line leans forward and gives it a stylish look. Surrounding the radiator grille, there are newly designed LED headlights, which are framed by day time running lights. The highlight of its frontage is the spirit of ecstasy, which further adds to its classy appearance. Then, there is a finely sculpted bumper, while the chrome finishing on lower grille gives it a contemporary look. The side profile includes several attractive features like chrome window sill, external rear view mirrors as well as door handles that are plated with chrome. Its wheel arches are equipped with an elegant set of 19 inch alloy wheels that are covered with run flat tyres of size 255/50 R19. The buyers also have an option to choose for a pair of 20 inch alloy wheels with 255/45 R20 sized radial tubeless tyres. Coming to the rear profile, it looks simply stunning with features like a radiant tail light cluster that surrounds the boot lid. There is a wide windshield that includes defogger as well as a high mount stop lamp. Other aspects like the bumper and chrome exhaust pipes completes the look of its rear end. The plush interior section of this Rolls Royce Ghost Series II Standard variant will certainly attract a number of car enthusiasts. It has a huge cabin space that is incorporated with lounge seats, which offer ample leg as well as shoulder room to its occupants. The front passenger seats come with electrically adjustable thigh support facility, which is a plus point. Furthermore, the owners can also opt for seat ventilation and massage options that adds to their convenience even during long journeys. The cockpit looks quite modish with a smooth and well designed dashboard that gets wood finishing. It is equipped with a steering wheel, which is wrapped with leather and the center console is finely designed. The revised instrument dials and clock has a striking look with different chaplet design and it includes 'Rolls Royce Goodwood' text on it, which further adds to its style. The car maker has powered this luxury trim with a powerful 6.6-litre petrol engine that comes with a total displacement capacity of 6592cc. It has 12 cylinders that are further fitted with 48 valves in it. This mill is incorporated with a direct injection fuel supply system. The maximum power generated by this motor is 563bhp at 5250rpm and yields a peak torque output of 780Nm at 1500rpm, which is quite impressive considering the Indian road conditions. It is mated with an efficient eight speed automatic transmission gear box that enables easier gear shifts. This vehicle can attain a top speed of 250 Kmph and breaks the speed mark of 100 Kmph in around 4.9 seconds, which is rather incredible. It delivers a maximum mileage of around 10.2 Kmpl on highways, which comes down to 4.71 approximately on the city roads. This variant has its front as well as rear wheels fitted with highly efficient ventilated disc brakes. Whereas, it has air suspension system featuring variable damping control for both the front and rear axles. This mechanism is quite reliable and helps in maintaining stability on any road conditions. It has a rack and pinion based steering system with speed sensitive variable rate power assistance. It gives excellent response, while supporting a minimum turning radius of 13.4 meters. There are a number of comfort features available in this Rolls Royce Ghost Series II Standard variant. It is offered with satellite aided transmission as a standard feature. This technology utilizes the GPS and mapping data in order to ensure it is in the correct gear. It has two tilt adjustable 9.2 inch monitors that are present at the back of the front seats. It is operated through a rotary controller that is available in the rear armrest. It is also available with optional features like rear seat entertainment package, a television tuner and an advanced 1200watt Bespoke audio system featuring 16 loudspeakers. Another interesting aspect is the large tilt/slide glass sunroof with a three piece roof blind. It has the comfort entry system, which includes the smart boot open or close functionality. The list of safety aspects in this variant include central locking system, dual front airbags, anti lock braking system along with electronic brake force distribution, side impact protection beams, security alarm system and many other such features are available that ensures maximum protection. 1. Plush interiors with many advanced features. 2. Excellent body design and styling aspects. 1. Fuel economy needs to improve. Rolls Royce రాయిస్ 16 వేర్వేరు రంగులలో అందుబాటులో ఉంది - White Sands, ANTHRACITE, Dark Emerald, స్కేలా Red, English White, Midnight Sapphire, Salamanca Blue, Smoky Quartz, Arctic White, Jubilee Silver, Silver, Black Diamond, Iguazu-Blue, Darkest Tungsten, Bohemian Red, పెట్ర Gold.